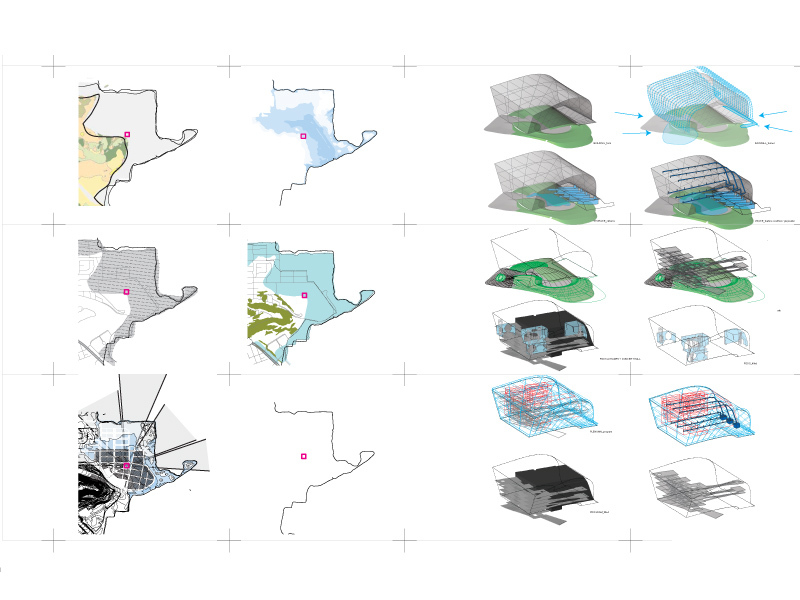 The design proposal is a redefinition of the conert hall typology through past, present, and future parameters. The reason for this approach is that there is a movement towards open sources, highly accessible music rather than a music industry of exclusivity and ownership. Geographical, Climatic, and Experiential parameters were chosen to inform the project at each phase of design. The form of the building was derived by both speculative and current conditions. Susceptible to flooding in the near future due to elevation, poor soil quality, and rising sea levels, the site will have to deal very intimately with a fluctuating water table. 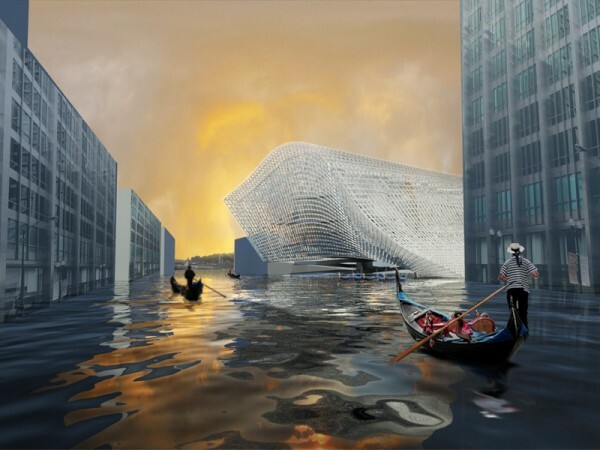 By raising up the building, the flooded terrain can exist underneath the building, requiring less of an architectural resistance. 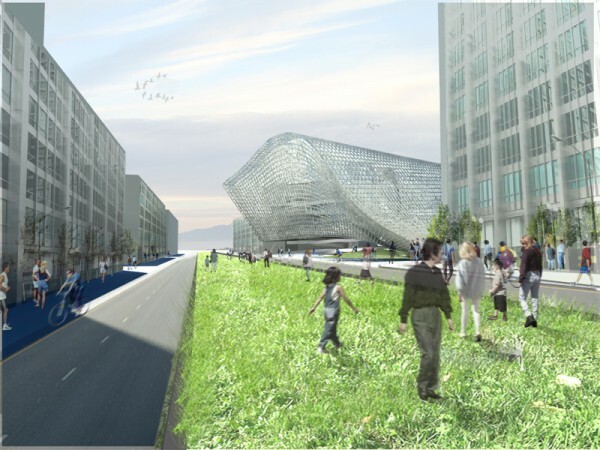 Wind patterns have helped derive the shape of the building’s swooped stance, while a twisting of the form allows for the building to orient itself with views of the new master plan and the East Bay. Similarly, the program is shaped by a series of parameters in order to optimize the general formal derivations. 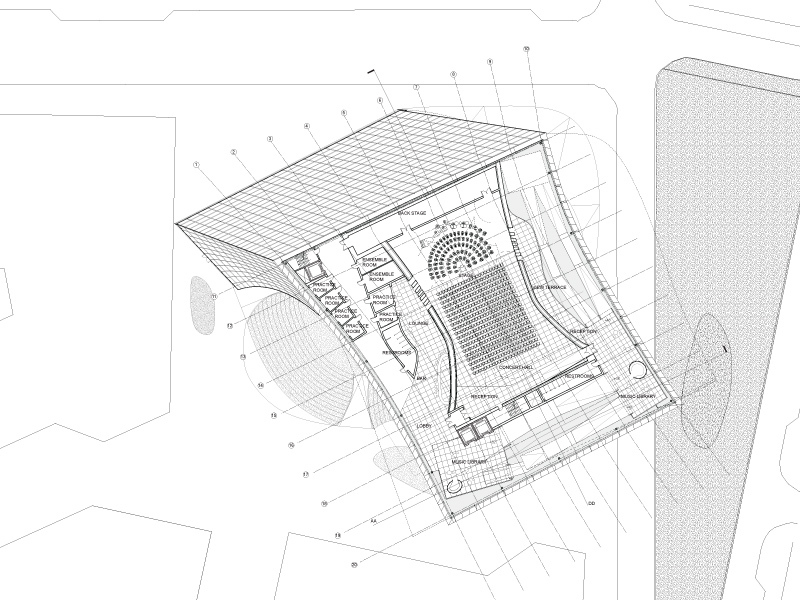 The open ground floor is allowed to become a sunken auditorium that can connect with the greater context of the new master plan. During flooded months, the sunken space becomes a reservoir that acts as a water feature and water storage that feeds the building’s cisterns. 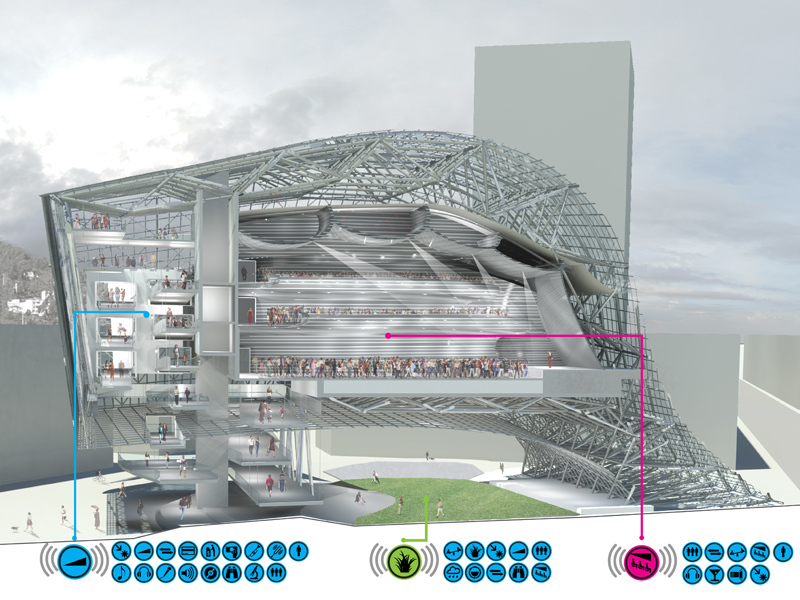 In order to connect the ground level with the raised concert hall, a large procession of ramps rises up into the underbelly of the floating form. At each switchback of the ramps, users are either able to experience views out to the city or interact with a series of music library pods. These pods allow for users to experience music hands-on in an independent or group setting. 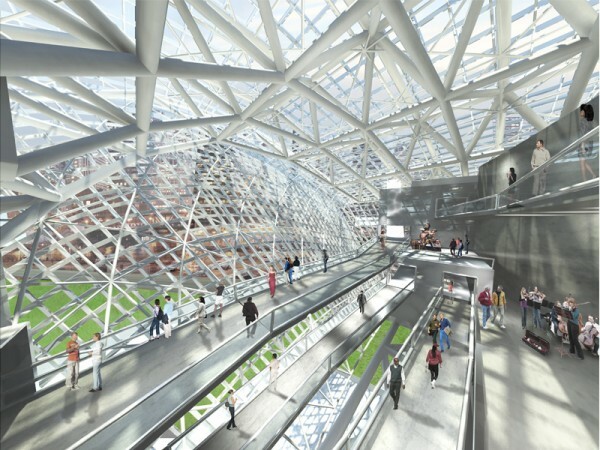 Live, acoustic, and digital music are exhibited and are responsive to increased activity, providing sound and light shows throughout the large atrium space. 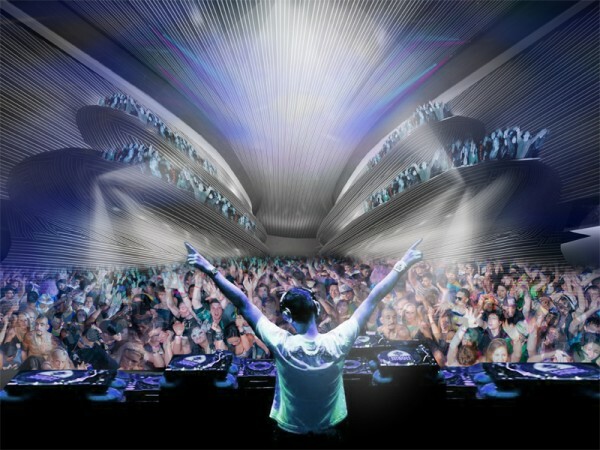 The arrangement of the form and the program within the large, mega-gesture serves users in many different, yet specific ways. While the large procession and music libraries are primarily geared toward patrons who want to experience the concert as an educational entity, musicians and performers are able to utilize different entrances and areas of the concert hall that better serves their specific needs. Concert goers are able to experience the concert hall in all its spectacle with re configurable lighting effects and seating arrangements in the concert hall itself, which feed into the music libraries and ramps.